In honor of October 28th's DVD & Blu-ray release of the heartfelt family film, Kit Kittredge: An American Girl, I'm offering you an insider's view of the DVD that Warner Brothers was kind enough to send my way. However, before I go into the DVD features, first I'll serve up a reprint of my original review (with bonus photos) published for its theatrical run back on 7/2/08. As every parent knows, all kids ask “why” but while most are satisfied enough by succinct replies to end their fleeting curiosity there, precocious ten year old Kit Kittredge (Little Miss Sunshine's Abigail Breslin) doesn’t neglect to ask the other five questions that go along with it-- namely the “who,” “what,” “where,” “when,” and “how” which all meld together to illuminate the bigger picture of whatever pops into her fascinatingly inquisitive mind. Based on the successful American Girl series of books from Kit author Valerie Tripp made popular in my own adolescence, Mansfield Park director Patricia Rozema’s earnest, unabashedly nostalgic and sweet-natured film which was penned by Chronicles of Narnia scripter Ann Peacock announces its aims towards offering something positive for women proudly from the start over opening credits which reveal that in addition to the writer and director, there were an uncharacteristically large amount of female professionals associated with the movie including executive producer Julia Roberts, whose own niece Emma had coincidentally starred in the most recent version of Nancy Drew. Given the outstanding production value of not only Drew but especially Kit, I’m remaining cautiously optimistic that the film won’t be buried in the wake of ultra-violent, special effects driven summer blockbusters and that it will not only earn a steady following increased no doubt by positive word of mouth but will also inspire more intelligent fare for young knowledge hungry audiences as impressively Kit seems to be a film entirely apart from what could’ve had excellent product placement potential, standing on its own as superlative and overdue family fodder. Set during the uncertainty of the Great Depression, we find Kit’s initial goal of trying to break into print journalism through the connection of her brother’s friend who erroneously assumed the young woman simply wanted a tour of the big, bad, masculine newsroom led by domineering editor Wallace Shawn, placed on the back burner when the effects of the trying economy and era hit home as her caring father (played by Chris O’Donnell) finds his car dealership taken over by the bank and he’s forced to venture to Chicago to find work to support his wife (Julia Ormond) and family. Not content to sit back and wait, Kit and her mother take in eccentrically zany boarders such as a husband hunting, flirtatious dance instructor (Jane Krakowski), Joan Cusack as a buttoned-up mobile librarian who’s a terror behind the wheel, and a part time magician and full time ham played by Stanley Tucci. When the gregarious and trusting Kit befriends two young hobos (Jumper’s Max Thieriot and Willow Smith) whom her mother employs to contribute in odd jobs in exchange for food, she encounters class prejudice after a series of robberies hits her sleepy neighborhood and all fingers point towards the hobos, inspiring Kit to once again rely on her budding reporter’s intuition and skills to sleuth out the case on her own in discovering the true culprits and helping to clear not only her friends’ names but also try and prevent her home from foreclosure. Although the primary audience will most likely be young girls and their mothers, this G rated feature packs a great punch in offering viewers a surprisingly complicated mystery—including one that does admittedly seem to confuse slightly in the final rushed act when clues are revealed far too quickly. In addition, it’s filled with important historical information that definitely echoes today in our struggling economy not to mention messages of loyalty, perseverance, tolerance, justice and friendship which make it ideal for viewers of both genders, if parents can manage not to mention the American Girl book series connection in getting their sons into the theatre. And speaking from the perspective of a girl who, much like Kit was far too eager to jump into the professional realm in her adolescence (and in my case trying to join Seinfeld’s writing staff at the age of eleven), it’s a wonderful celebration of childhood innocence and the reminder never to diminish a child’s dream, especially when like Kit, they’re more concerned with intellectual pursuits rather than begging for trips to the mall to buy toy tie-ins to other summer blockbusters. Although in the case of Kit, as an aunt, if my niece were just a few years older, I wouldn’t hesitate to purchase her a Kittredge doll in lieu of Barbies and Bratz. Winner of the Heartland Award certifying Kittredge as a "Truly Movie Picture," the DVD offers 3 formats for your viewing pleasure-- the original widescreen aspect ratio which preserves the theatrical version and is enhanced for widsecreen televisions, a full-screen edition which is modified from the original but formatted to fit the shape of your screen, as well as a digital copy you can download to play on your Mac, PC, Video iPod or other portable video device. Featuring a gallery of of trailers from the other American Girl Movies that went straight-to-DVD and can be purchased below by checking out the Mini-Amazon American Girl Collection Slideshow I've provided, Kit's DVD also boasts features that are enhanced for DVD-ROM equipped personal computers. Additionally, the film provides English and Spanish subtitles for the deaf or hearing impaired as well as crystal clear Dolby Digital 5.1 Surround Sound. 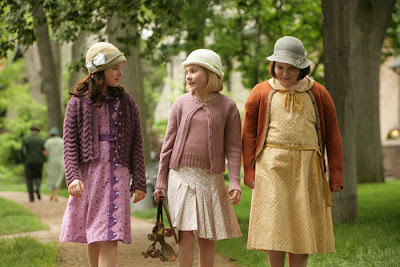 Hands down the best live action (or non-animated) children's film I've seen in 2008, Kit Kittredge is one you should definitely introduce to the women in your life-- whether it's your grandmothers who may recall the time period firsthand, your mothers, or for the next generation and its target audience of children and grandchildren. An extraordinary, underrated gem-- follow along with Kit and stay on the case until you bring this highly recommended disc home on DVD or Blu-ray.